In a nod to National Disability Employment Awareness Month in October, Starbucks will feature refillable Braille cards. 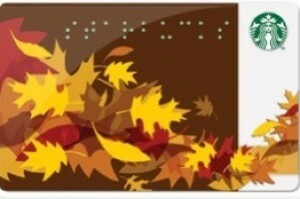 The card features an autumn leaves theme and will have the word “Starbucks” embossed in Braille at the top. This is a fantastic way to raise awareness for the Department of Labor’s annual employment campaign, and one that actually helps people who are visually impaired. Braille users can “feel” for their card in their wallets, without wondering if they took out a Dunkin Donuts card by mistake. Since the card is refillable, if I were a Braille user I’d scoop up a bunch of these. The question is, where? The local Starbucks I work out of in Stamford, Conn., unfortunately doesn’t have the Braille cards yet. The staff, who are super friendly, seemed a little uneasy when I asked about the cards. One barista said she had “heard about them but doesn’t have them yet,” and she “would have put them out already” if she had them ready to sell. Fortunately you can get the cards online on Starbucks’ website. Starbucks is a socially responsible company that makes an effort, where others don’t, to include people with disabilities. Embossed Braille cards are a small and inexpensive way to make a top-selling product more universal. I’m amazed that it took a coffee maker to start this trend, where other companies that have been making and marketing cards with every color, bell and whistle for decades — for example, American Express and Bank of America — hadn’t thought of this before. Currently you can get your statements in Braille, but that’s a requirement for financial companies. that uses an Electric Active Plastic to display the amount of the transaction in Braille and reconfirms it with audio feedback from a built-in speaker on the card. Check it out here. A more interactive credit card that gives shoppers more control works for everyone. That’s why mobile payments over iPhones and other accessible devices have such potential for people with disabilities — and even those without. After purchasing your third latte of the day, wouldn’t you appreciate a little voice telling you much you’ve spent?